SHOULD THERE BE A NEW NORTH DOWNS NATIONAL PARK? National Park status provides the highest level of landscape protection. British National Parks are great landscape conservation zones, where all forms of life and land are carefully protected. At the same time they are working landscapes with residential, economic and communication considerations and subject to relentless development threats. Containing much freedom to roam dramatic landscape, these areas are of exceptional scenic, historic and recreational value. They are also substantial economic generators with visitor experience high on the agenda. National Park status provides a means of harmonising these often conflicting pressures before it is too late! Much of the downlands of Surrey and Kent already have formal recognition and some protection as Areas of Outstanding Beauty (AONB) with administrative bodies in situ. Surrey was first designated in 1956 and Kent in 1967. These designated areas provide a starting point for considering whether a North Downs National Park should encompass both counties. For more details of the AONBs click on the respective logos below to view their web sites. Although the North Downs National Park is expected to extend across most of the North Downs, encompassing areas not at present within the curtilage of the AONBs, at its centre lies Banstead Commons, Like the Malvern Hills, Banstead Commons can be considered one of England's original National Parks in everything but name; owned by the people for the people. This makes it a good role model. Most of the Banstead Commons are in public ownership, being owned by Reigate and Banstead Council, as a result of the Metropolitan Commons (Banstead) Supplemental Act of 1893. The Commons are managed by the Banstead Commons Conservators. This committee is appointed from relevant public bodies and also nominated by the public. The posts on the board are voluntary and unpaid. The Commons range from the M25 in the south to the border of the London Borough of Sutton in the north and comprise a total area of about 550 hectares (about1350 acres). As well as providing freedom to roam recreational areas, the open spaces of the commons are important wildlife habitats. The Clerk (part-time), The Warden, The Keepers, (two full-time and 1 part-time) who perform the day-to-day tasks under the supervision of the Warden. The historic chalk uplands of the North and South Downs (in green) from Smith's geological map of 1820. London lies to the north (pale blue). The South Downs are now a National Park. Seven Reasons Why the North Downs need National Park Status. 1. 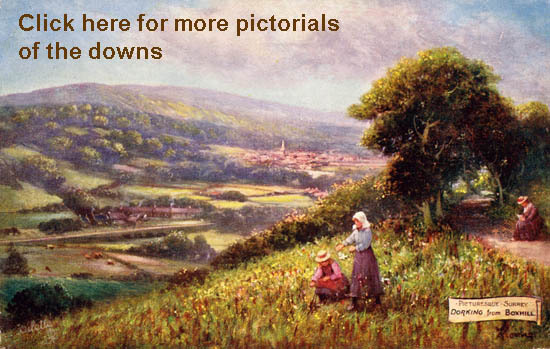 To curtail the relentless urbanisation of the North Downs in Surrey and Kent. 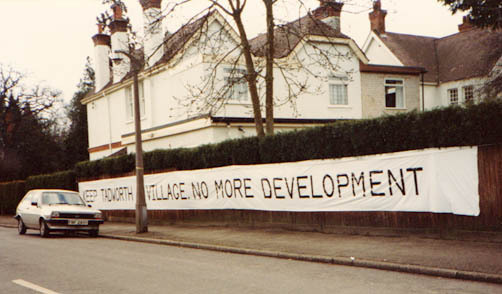 Urbanisation has long been a major concern on the North Downs and the protection of the open commons has been a hard fought battle over the last 150 years. In spite of this, the commons are still encroached when needs appear to justify. Subsequent land swap results in portions isolated from the main areas. The Commons Conservators are in effect run by local councils and this arguably causes conflicts of interests. Conservators were originally envisaged as independent bodies with representative councillors on their board. A typical current example prevails in Tadworth and concerns Green Corner, the Green in front of the Grumpy Mole public house and green verges on the Dorking Road near the Mill Road intersection. A development is proposed for three houses to be constructed abutting Green Corner in addition to the new flats currently under construction. Whilst the council will receive a considerable sum of money from the developers if the proposal goes ahead, local residents are extremely concerned about the character and appearance of the proposed buildings. It transpired at a recent planning public enquiry that the common land at Green Corner had been deregistered, Residents are concerned what, if any, undertakings are being made by the council on the deregistration of the common land in front of the new flats. The site overall is part of the transition zone between urban and green belt and the developer is relying on trees on what is now council land to screen the view of the development from the commons. The council has a conflict between its obligations to plan for and provide availability of land for housing but this is inconsistent with its status and role of common land management and the Council's duties as a public authority. If the entire area had National Park status as proposed this conflict would have been easily resolved, whereas now the voice the Conservators and the AONB management has been muffled by the deregulation of Green Corner. This proposal was penned in early 2016. Since then the Tadworth Neighbourhood Forum has published in the Tadworth Tribune an updated summary of current planning issues. It illustrates why there is an ensuing air of mistrust haunting many developments that threaten the heaths and common land. To read the editorial "Update on Village Affairs" in full on page 7 click here. 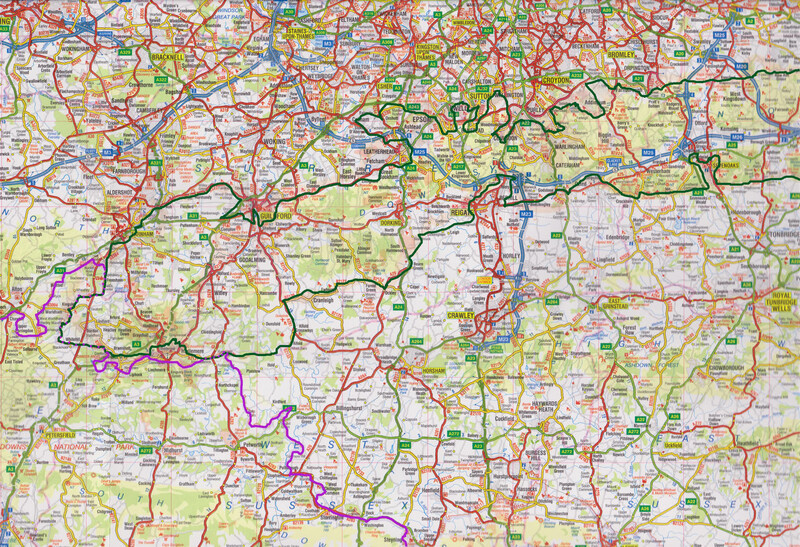 Then to return to this web page go to www.BritishNationalParks.com and click on the North Downs logo. 2. A National Park offers blanket protection against inappropriate development and encompasses villages rather than fragmented selected sites. AONB v National Park v Area of Great Landscape Value? Much of the North Downs is protected by Area of Outstanding Natural Beauty (AONB) or the less stringent Area of Great Landscape Value (AGLV) status. AONBs and National Parks are recognised in England to be on a par legally because of their nationally important landscapes. The National Planning Policy Framework confirms that AONBs are equivalent to National Parks in terms of their landscape quality and scenic beauty. AONBs are largely managed by local authority advisory committees, whereas National Parks require a special authority of their own. The statutory planning process is the responsibility of the National Parks Authority, whereas, within AONBs, this is the responsibility of the individual local planning authorities. National Parks are largely located in upland areas and AONBs are mostly lowland landscapes. The North Downs is an upland area. AONB landscapes tend to be more gentle and rolling in character, and not as rugged as National Parks. National Parks can also include built areas such as villages. National Parks are legally obliged to provide for public recreational opportunities, whereas AONBs are not. As such, National Parks can provide a plethora of appropriate visitor services to the public with infrastructure to accommodate such facilities. In the case of the North Downs the freedom to roam chalk landscape with distinct building materials such as flint and Merstham stone arguably justify the blanket protection of a National Park, encompassing the AONB and incorporating the AGLVs within its boundaries or within its view. 3. It will offset the impact of industrialisation elsewhere in the South East including Gatwick and Heathrow airports. London is steadily expanding and as the infrastructure grows there are tensions between environment and enterprise. Heathrow and Gatwick airports are local examples of current concern as they seek to construct additional runways and increase air traffic. The tensions so created need to be resolved and one way of doing this is to ensure that the populace of the south-east has environmental guarantees as well as the economic benefits of industrial expansion. The North Downs stretches along the southern perimeter of Greater London and the M25 and M23 act as corridors for the relentless traffic that passes to and from the airports and around the capital. A North Downs National Park status offers environmental guarantees that retain the green landscape whilst accommodating the nearby hubs of industry in the south-east. 4. It will provide a readily accessible, green, healthy, recreational breathing space for the populace of London and the South East. A North Downs National Park offers an environmental haven in the immediate vicinity of Greater London but with the motorway and railway infrastructure in place does not jeopardise the expansion of commercial enterprises. At the same time, the motorway and railway infrastructure would remove the heavy traffic from the recreational areas of a North Downs National Park. Being a National Park does not negate residential use and over 2.3 million people live in National Park or AONB landscapes. 5. Visitor experience is high on the agenda and therefore a National Park is an economic generator. Far from being sleepy backwaters, England's finest landscapes contribute more than 20bn pounds each year to our economy. The publication 'So Much More Than A View' (2015) from England's Areas of Outstanding Natural Beauty (AONB) and National Parks, highlights the wide range of economic as well as environmental benefits these iconic areas provide. Covering a quarter of England, National Parks and AONBs are some of our most beautiful and cherished landscapes. They come with unique archaeological and historical sites and valuable wildlife habitats. Yet they provide so much more to society than a beautiful view. More than two thirds of people in England live within half an hour's travel of a National Park or AONB. AONBs and National Parks welcome more than 260 million visitors who spend in excess of 6bn pounds and support thousands of jobs and more than 85,000 businesses. Rightly regarded as a treasured national resource and internationally recognised for their special qualities, they provide a base for businesses that rely on a high quality environment; creative and sporting inspiration; homes for people and wildlife; food and drink; and life enhancing experiences for millions of visitors of all ages. This particularly applies to the National Parks which have public recreational opportunities at the top of their agenda. In spite of this, the cost to the tax payer is less that 1.00 pound per person per annum! 6. The blanket coverage coordinates many local and regional countryside initiatives under one authority. On the North Downs there are a plethora of managing agencies including two AONB management organisations to various Conservators for heaths and common land. In addition, there is the often conflicting interests of local and district councils. As a result, many organisations manipulate to ensure that their own objectives are met rather than a resolution to achieve regional common objectives. An overlying National Park Authority resoles this dilemma, with members of individual bodies participant on the Board. 7. It protects the green heritage that earlier generations fought hard for. The battle for the countryside is long running and has had successes as well as failures. Most initiatives start at grass roots level and gain public and political support when the strength of public opinion is recognised. Economic progress is valueless unless it offers individuals a better lifestyle. Environment plays a major role in promoting quality of life. The benefits to mental and physical health from the countryside are well recognised. This particularly applies to the populace of Greater London where traffic pollution is deemed a major health hazard. The North Downs National Park offers a means of retaining such qualities within easy reach of the populace of London and the South-east. Tadworth is a village on the Downs and the people who live there long appreciate the freedom to roam the countryside that surrounds this typical down land village. There is more freedom to roam land around Tadworth than the entire South Downs National Park. This environment of the North Downs needs to be protected and administered for future generations. In this document Tadworth in Surrey is used as an example. The sources used for collating this information include relevant authority web sites and publications. It does not include findings from original research commissioned for the purpose. It is estimated that the size suggested for the North Downs National Park will be about 1492 sq. kilometres. This makes it a medium-size park, slightly smaller than the South Downs National Park. 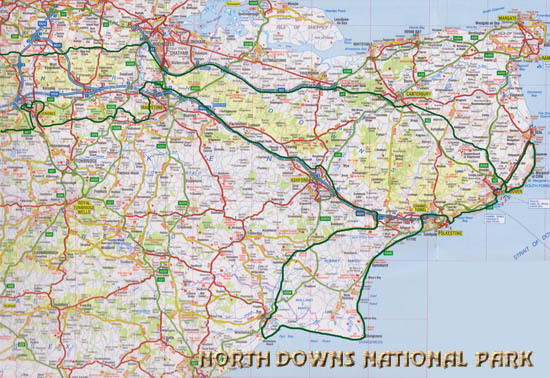 The maps below indicate a possible delineation of a North Downs National Park (dark green line). In the west it abuts the South Downs National Park (purple line) and in the east it reaches the sea and the white cliffs of Dover. Determining the final delineation of the Park is a major discussion and consultation between interested parties. This can take up to two years. A possible interim stage would be the appointment of a Conservation Board; this would unite the management currently in the hands of the variety of public bodies that control much of the down land. This is not a new fight, as the picture below taken at Tadworth last century indicates. Today this view is obscured by parked vehicles. The agenda for a detailed study of the North Downs. The purpose of the study is to provide detailed information that will aid the preparation of a precise boundary for a North Downs National Park. The following lists the considerations recommended for investigation. 1) The viability of reformulating the status of the Banstead Commons Conservators as an interim Conservation Board incorporating the administrative bodies of the two AONBs. Such a Board would be a precursor to a full National Park Authority. This replicates the evolutionary process used in more recent National Park designations in the South Downs and the New Forest. For more information on the current status of the Conservators click WEB SITE below. * Areas with existing 'freedom to roam' - mostly commons and public parks. * Important wildlife habitats - Sites of Special Scientific Interest, Nature Reserves etc. * Areas managed by existing agencies to ensure their protection - Woodland Trust, National Trust, Local Authorities, etc. * Important archaeological and historic sites and historic estates. * Towns and villages with Conservation Zones or an above average number of English Heritage Listed or otherwise protected buildings. * Significant tourist attractions and facilities that could be incorporated in the National Park to advantage. 3) Utilising the data collected in 2) above it is then possible to define an area that can be mapped in order to ascertain boundaries and acreage of a North Downs National Park. This would include substantial areas of green countryside hitherto undefined in 2) above, which are well accessed by public rights of way such as footpaths, bridleways and other means of non-mechanised public access for recreational purposes. 4) It is proposed that in order to aid the tasks above a dynamic web site is created. This would enable interested members of the public to voice their views as to what should be inside or outside the boundaries of a possible National Park. The result would be the enhancement of the robustness of the proposal as it is prepared. 5) This initiative for the North Downs National Park is from a team of volunteers who give their services without charge yet with each offering valuable specialist skills. Much of the above research work requires full time participation by knowledgeable people familiar with countryside issues. This is not sustainable to a team of volunteers. It is proposed therefore that an approach is made to a major academic institution that has a strong physical geography department to ascertain whether this could be incorporated in a doctoral or master's degree programme. To fund this, a sponsor should be sought from a suitable commercial company that has countryside conservation high on its agenda and in its marketing plan of corporate positioning. Proposed Boundaries of the National Park (outlined in dark green). Click the maps below for larger images. 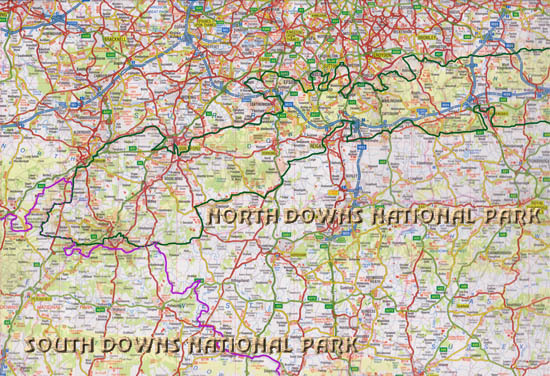 The maps above give suggested boundaries for the North Downs National Park (dark green). 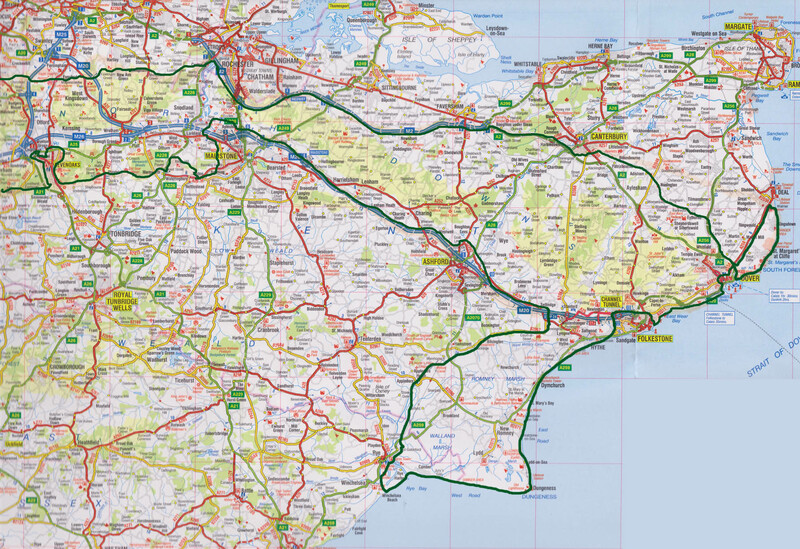 The estimated size of 1492 square kilometres makes it a medium size park, slightly smaller than the South Downs National Park. In the West the proposed North Downs National Park abuts the South Downs National Park (purple). Tadworth is a traditional English village strategically located in the centre of what could become the North Downs National Park. Recently an updated and extended version of the compilation describing the Tadworth Idyll became available. First used in part on the Tadworth Tower web page it is now extended and published in hard copy report format. 'Tadworth the Village on the Downs' was prepared in conjunction with the Tadworth Heritage and History Group and includes much more information about Tadworth generally. The document is presented as a first step in setting the scene for the establishment of a North Downs National Park. It is in A4 portrait format and includes many coloured pictures with about 70 printed pages. "....thanking you very much for the copy of your book which you so kindly sent me. I am really pleased to have it and have been enjoying reading it. Your love for your Water Tower and Tadworth shines through and I admire all the research you have done over the years." Lorna Beckett, Chairman of the Rupert Brooke Society and author of The Second I Saw You (2015) which details Rupert Brooke in Tadworth. 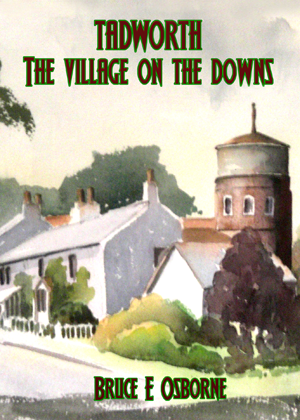 Copies of Tadworth the Village on the Downs can be secured from the author at Tower House. A nominal charge is made of £10.00 per copy to cover preparation and printing costs. In addition packing and postage is charged where relevant (allow £4.00 for UK). Subject to availability which is limited. 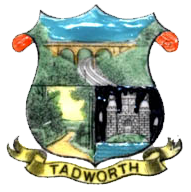 LINKS - To go to the Tadworth Tower House web page click the Tadworth coat of arms above. Where is the Windmill? A Proposal from Dr Bruce E Osborne, local resident. 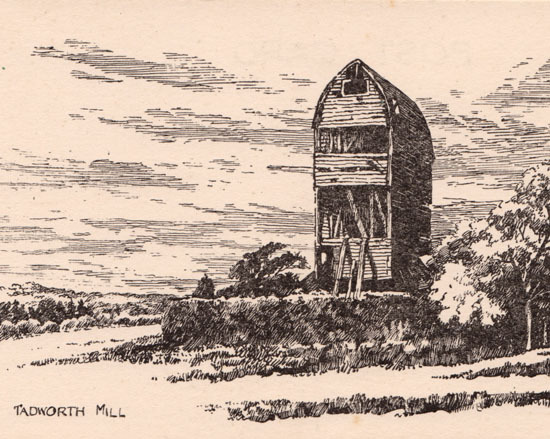 The Tadworth Mill, in the first phase of its life, was an agricultural structure that dominated the local landscape. It was in a prominent position on the Dorking Road at the top of the rise, uphill from the Dukes Head. Surprise, surprise, it's still there but now masked by trees. In its working days, the last thing the miller would have wanted was trees to shelter it from the wind, but all has changed. Today it is a Grade 2 listed structure that largely goes unnoticed. We have to ask is this the right role for this icon of the past? Dating back to medieval times, a mill at Tadworth has long been a significant landmark. Five hundred years later, by the 1800s, two mills were known to be operating on the site on the Dorking Road. 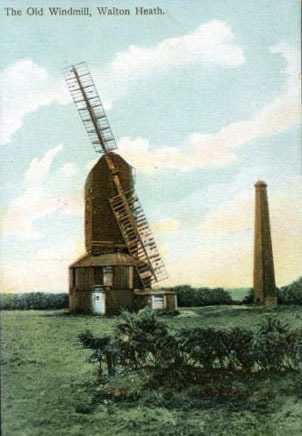 Both were post-mills where the entire mill could be directed into the wind by turning it on a central post. Another century later, one of the mills had been demolished and a steam engine assisted the wind in operating the equipment for the miller. 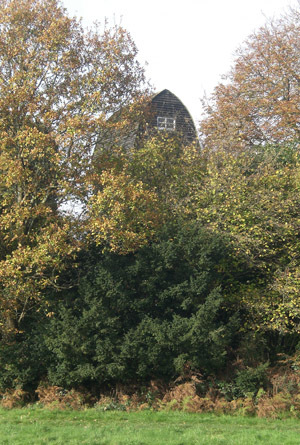 Photographs show the surviving mill and a slender tall chimney nearby. Milling ceased on the site around 1902, after which the mill matured into its second phase of existence, a landmark. Despite the ravages of time, the mill has survived. It was even featured on post cards for visitors up to the 1970s. It survived not as a working agricultural structure but as a nostalgic reminder of former times as well as a prominent landmark for ramblers to take their bearing from when they explored the North Downs. Phase 1, A former industrial site on the common c.1900. Today, all this former imagery has disappeared as the mill slides into a third phase of low public awareness. It is on a site that is eagerly sought for development. It is no longer a landmark that is visible for miles from across Walton Heath and Mogador. Today, it is buried in a small dark forest of mixed evergreen and deciduous trees that exclude visibility and light the year around. With it being listed, one would have hoped that this would have preserved its second phase as an iconic, historic landmark. So is the third phase, one of having no role or purpose, inevitable? One idea stands out above all others. It involves the entire isolated plot of land on which the windmill stands, possibly including the existing 1920s-style houses. The site stands boldly on the hill top overlooking the priceless freedom to roam landscape of the North Downs. It has nearby road, rail and motorway access. It also has local infrastructure that includes shops, cafeterias, restaurants and even a hotel at Burgh Heath. For Tadworth to retain the character of the landscape, the down land location in the immediate vicinity of the mill must be kept clear of fencing, trees and excessive development both industrial and residential. The idea that stands out is to use the site to develop a fully-fledged Countryside Centre for the North Downs, with the windmill as the iconic centre piece. Phase 3, Lost and forgotten in a forest of trees or awaiting a new role in 2018? The centre could be similar to those of the National Parks, attracting visitors keen to experience the open spaces and wildlife of the North Downs. As well as the usual café, car park and toilets, facilities could extend to a lecture theatre for children to be introduced to the unique landscape, retail facilities for local products and literature, horse riding, a local art gallery and craft centre, all related to the down land experience. The list is endless. Even the windmill could be restored to grind grain once more. The result would be a new influx of visitors generating income that could be invested in future downland protection. At the same time, it would enhance awareness of the value of the landscape and ensure that future development of the North Downs is conducive to the best countryside interests. It may even prompt, one day, the establishment of a visitor centre there for the North Downs National Park with Tadworth at its centre.